The designers at Charlott Atelier believe that beneath the everyday smile is a poster worthy pin up girl ready to shine. That’s why they have created a site full of beautiful vintage clothes for any occasion. From shoes to petticoats and boleros to retro dresses, this label is all about capturing the alluring beauty and poise of a bygone era. Russian designer Charlott Atelier has been drafting and making clothing since she was a teenager, but recently she has honed her skills to concentrate on the 1950’s vintage fashion style. Featured in the “Walk of Fashion 2013,” this brand’s creative success has been well received all over the world. 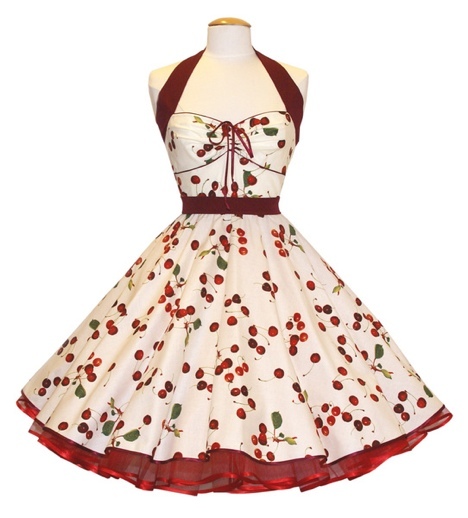 There are several storefront locations in Germany, but now these fabulous rockabilly dresses can also be browsed and purchased online and shipped worldwide. At their site, it is easy to see that Charlott Atelier’s particular passion is for petticoat dresses and skirts. Browse their beautiful selection by pattern or fabric type with the ability to search for florals, stripes, polka dots, and checkered prints for some rockabilly fashion flair. These sweet pin up dresses come with the crinoline petticoats attached for convenient one stop shopping. 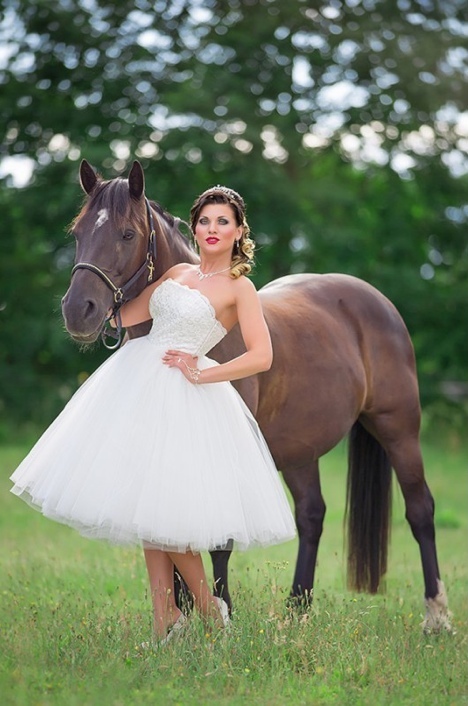 For special occasions, check out their selection of retro and rockabilly wedding dresses that are perfect for the big day. Choose from beautiful white pin up dresses or add a splash of color with a bright sash tied at the waist. Artfully crafted with the vintage bride in mind, these gorgeous 1950’s wedding dresses and accessories are picture perfect. Though Charlott Atelier specializes in petticoat dresses, their vintage designs cover much more, including children’s vintage clothing. Little girl’s crinoline petticoat dresses are completely adorable, and can even be purchased with a matching dress in an adult size! Accessories include shoes, gloves, purses, and even retro lingerie. For men’s accessories, check out their dashing suspenders, neckties and handkerchiefs. There is even a page of traditional German pin up dresses perfect for Oktoberfest! So whether you’re looking for your dream rockabilly wedding gown, a cute vintage dress for the little girl in your life, or some rocking retro accessories, you’ll find the complete 1950’s look at Charlott Atelier. 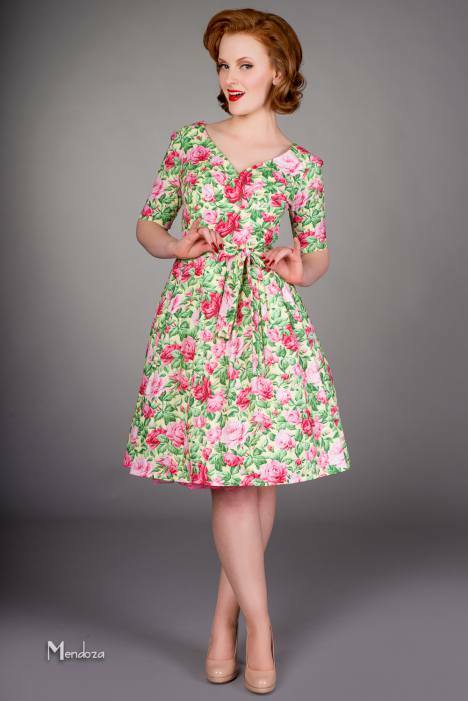 Based in greater Manchester, Limb Clothing features a collection of gorgeous pin up dresses and skirts for the iconic fashion look of the 1950’s. By keeping the selection small, Limb Clothing ensures quality and fit of their merchandise, designing each piece for the perfect fit. For this reason, Limb Clothing rolls out a new collection of dresses and skirts every year, so keep checking back for the latest vintage designs! Browse their dresses by design title to find a host of bold fabrics to choose from. In the Hawaiian dress design, large and colorful floral patterns evoke the tropical paradise memories of beach days gone by. Other dress designs are inspired by icons like Betty P, Sally Anne, and Polly. In one of these eye catching dresses, anyone can look like a bombshell beauty straight from the pages of fashion history. In this year’s Victory Parade collection, you will find skirt styles in pleated or pencil to accentuate your feminine curves. Some prints boast fun teapots or cute panda bears while others rock retro geometric patterns or pinstripes. Pair with a crinoline petticoat for a silhouette straight out of a pin up ad from the vintage newspaper. These looks are perfect for an everyday shopping trip or a special party where you want your timeless fashion sense to shine. 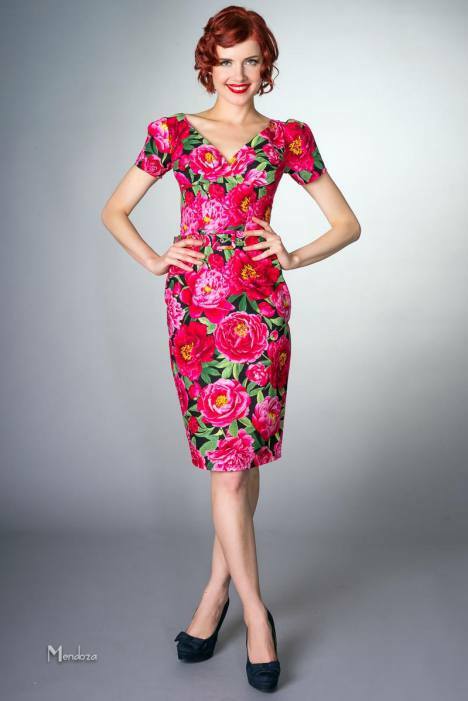 If it seems a little chilly to be rocking your new Peggy Sue pin up dress, never fear! Be sure to browse through their dress accessories including stoles, shrugs and wraps. Hand-stitched of faux fur, these wraps offer the luxury and class of the look without harming any of our animal friends. Quality and fit are the top priorities at Limb Clothing and they take great care in producing each design to the highest standards. There is a great return policy if you feel your outfit does not completely suit you. Best of all, they are able to keep their prices relatively affordable for the entire brand. Because these designs are limited in quantity, it’s easy to miss an opportunity for a great vintage look. Limb Clothing recommends checking back often for style updates and hot new items. 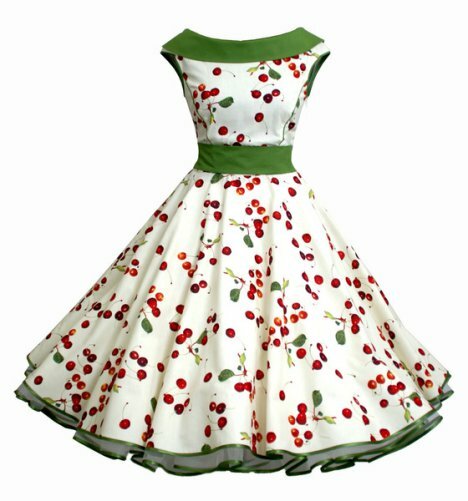 Pin up lovelies and rockabilly lasses, if your dream is to don the cutest clothes in all the land then check out Heart of Haute today. This vintage-inspired retro clothing line and shop founded by mom-and-sprout duo Teresa Becker and her darling daughter Amanda Marie has scads of simply adorable dresses, skirts and tops in fun fabrics that fit and flatter like a fantasy. Started as a home-based business in 2005, Teresa and Amanda’s labor of love grew and grew and by 2009 that had quadrupled their warehouse space. “Made with love and no regrets”, as their slogan says they manufacture all their clothing in the United States and are committed to creating local jobs. What makes Heart of Haute clothing such a success? High-quality fabrics and excellent design and craftsmanship at an affordable price go a long way but what really takes their apparel one step further are their playful and delightful interpretations of classic pin up styles. Their Mary Mary Gypsy Skirt has a little extra, made from Our Lady of Guadalupe fabric with a wide tie band. Their A-line Astro Dress in “Gizmo” is flatteringly unique and their swing-skirted, empire waist, round-collared Beverly Dress comes in solids, patterns and gingham but my favorite is the “Dixie”. Heart of Haute will ship anywhere directly from their site but be sure to allow 7 to 10 business days for your order to be completed and shipped because Amanda and Teresa keep low inventory and may have to create your clothing just for you! Returns and exchanges are A-OK within 3 weeks of the shipping date as long as they are unworn and have their tags attached and you can pay with PayPal, American Express, MasterCard, Visa and Discover. And where else can one find the charming clothing that these lovely ladies design? International jet setters can visit stores all over the globe that carry their apparel like Cats Like Us in New York, My Baby Jo in California and Gasoline Alley in New Mexico, Grease Monkey in Canada, Gutterpunk in Australia, Miss Mole in Germany, Unique Cheesecakes in Iceland and Rustic Frontier in Japan. Homebody cheesecakes can find Heart of Haute on the web through online retailers like The Atomic Boutique, Baby Girl Boutique and Top Vintage. Today’s fast paced and technology driven world makes many wish for the times of face to face contact instead of Facebook and sending letters instead of Email. This nostalgia springs from the belief that the past was a simpler time when men were suave and charming and women were innocent and well-behaved. However, there is no need to idolize the past when one can embrace the true spirit of days gone by with Rumble 59. This German retailer shows the past as the rebellious and edgy climate it really was, and all designs embody the rockabilly lifestyle. Women do not have to wait for a jock to give them a letterman jacket anymore when they can purchase their own. Ladies who want a casual and vintage outfit for the daytime can pair the jacket with a high quality printed shirt from the Rockabilly Rebel line and be ready for lounging at the diner with milkshakes or taking a ride on a motorcycle. Rumble 59 also has looks for those who love pin-up and rockabilly styles. Women can be beautiful and feminine while still able to rock with everything from denim pencil skirts with clean lines and a snug fit to tight striped shirts that show off a woman’s assets. Both men and women can enjoy the line of denim Rumble 59 produces because it is not artfully distressed, torn, ripped or otherwise modified in the name of fashion. Store bought imperfections are fake, but this denim is genuine. Wearers will have to earn faded denim and flaws in the material by getting dirty, partying and living fearlessly. Greasers, ruffians and moonshiners can enhance their outfits with accessories like flasks, switch blade inspired combs, bold belt buckles and more. Whether drag racing with a bandana or finishing a perfectly styled hairdo with a checkered headband, Rumble 59 ensures you look rockabilly chic from head to toe. There is no need to idolize the past when it is possible to find beauty in classic rock idols, old school street gangs and smoky lit bars. Rumble 59 brings the past back with these glamor meets grunge outfits that should never go out of style.